At twelve months, the novelty of using a toilet, teamed with your fledgling toddlers still relatively easygoing nature, made her potty putty in your hands. But that was then, and this is now. Now the novelty’s over – toileting is no longer a lark she enjoys voluntarily, but a chore she’s being pressured into performing. Over too, alas, is the golden age of agreeableness. Instead of being eager to please, your toddler may now be out to displease. It may also be that you were the one who was trained in the first place. 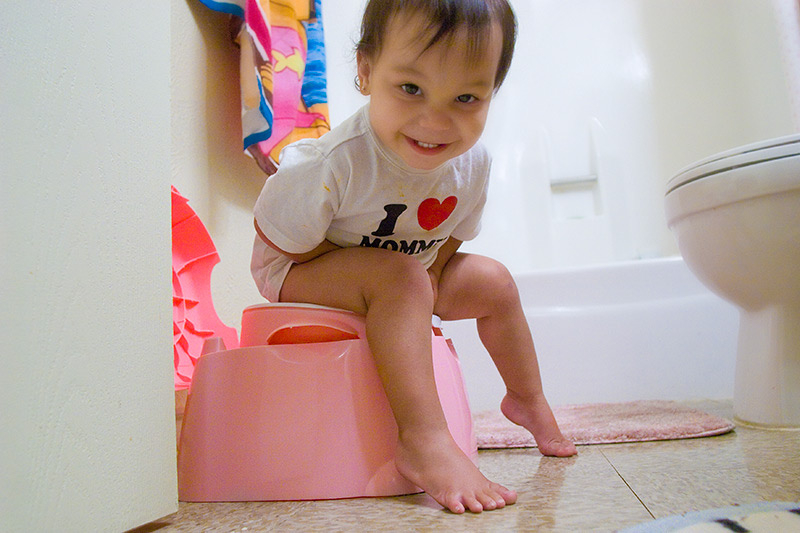 You put her on the potty after meals, the minutes she squatted or grunted, over when she awoke after a nap. Now she’s not as willing to be manipulated. Trying to control your daughter at an age when she’s programmed to resist control is bound to result in failure and frustration for both of you. Coercion won’t yield a potty-proficient child any sooner than a laissezfaire attitude will – in fact, coercion could lead to constipation, if your toddler begins to rebelliously withhold the source of conflict in order to retain control of the situation. Instead of showing concerns over her lapsed bathroom skills, accept that toilet learning was initiated prematurely. Drop the matter entirely for now – without even a whisper of parental grumbling. Continue to remind your child about the concept of using the toilet by pointing out that you (and other family members and friends) go on potty; letting her join you in the bathroom (‘See, Mummy – or Daddy, or Brother, or whoever – is’ and use any term you and your family are comfortable with to describe the biological function, for example, urinate, wee); occasionally pointing out to her ‘big’ children who don’t wear nappies (without telling her that she’s a baby for wearing them); and by reminding her cheerfully that when she’s a big girl, she won’t wear nappies, either. Continue to keep her potty-chair available. If she asks to use it, then by all means let her; if she doesn’t, wait until she’s good and ready – which could be months from now, or a year, or even longer. Just because your toddler tells you that she needs her nappy changed doesn’t mean she’s saying she’s ready for toilet learning. Indicating that she’s wet or has dirtied her pants is one of the signs of toilet-learning readiness, but it isn’t the only one. And for toilet learning to be successful, all system should be ‘go’ (so to speak).